Smoke gets in your eyes. The smoke gets into more than your eyes, as at times you can smell it even inside the house. It’s second-hand smoke courtesy of Mother Nature, whose behaviour has become increasingly disruptive. 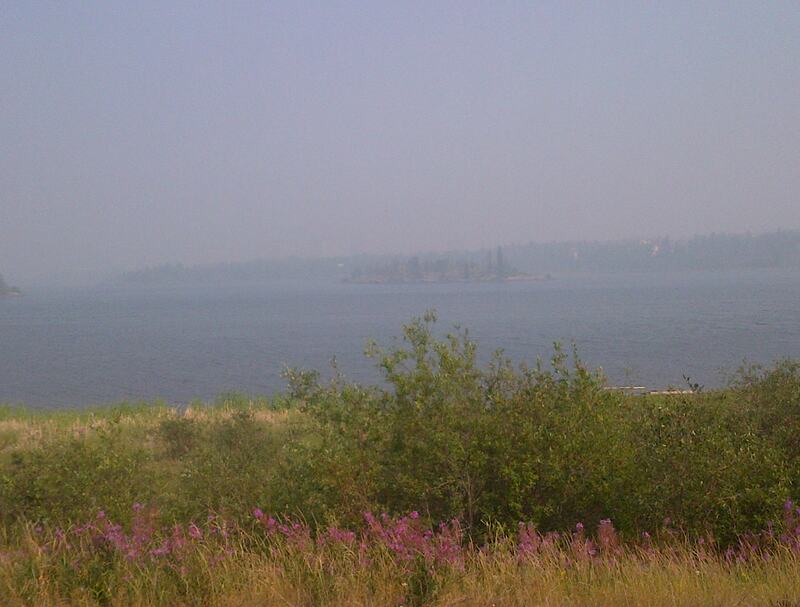 Highway 3 (the only road linking us to civilization) has been closed frequently, as either the fires have advanced too close to the road, or their smoke has rendered driving unsafe due to poor visibility. Drivers who might have been lucky enough to get to Yellowknife have found themselves unable to get out when they want. You really don’t think about the one-road situation, until that road is closed and you feel trapped. To ensure that the life of the trapped is never dull, every now and then the electricity goes off. If you live here you know that’s par for the course, but generally not during the summer. The upside is that with the long days there’s usually enough natural light indoors for you to see clearly even at night…assuming there are enough windows. These days, the cuts have been occurring more than once a day. One day it happened twice, the next day three times. Resetting the clock on the stove is an exercise in futility. It could be worse: fire has robbed some people of their home and forced others to evacuate their community, so I’ll take the power cuts. I heard a partial explanation for two of them on the local news. Evidently the fire got close to a major power line, which caused the line to ground and automatically shut off, at which point the generators kicked in, but then lightning hit the generators and we were stranded again. A spokesman for the department of Environment & Natural Resources indicated that lightning has been responsible for many of the fires. The territory is enormous, but I confess that I was suprised to hear about all of this lightning, because I had yet to see any…until July 30th. On that day, we experienced what is now referred to as the “Apocalyptic storm“. It was a hot day until around 4:30pm, when the smoky sky turned an eerie yellow, then a bizarre orange. Soon, dark clouds rolled in and around 5pm it was pitch-black like night, unheard of at this time of year. The breeze cooled and a freak storm moved in, complete with thunder and the offending lightning. Mind you, dark clouds have formed on many days this summer, and once I even heard thunder rumbling, but there was no lightning. There wasn’t any rain either. Rain in Yellowknife is like a man who is full of what Trinis call “gun talk” – full of fighting words, but not much fight in him. The skies threaten, but rarely does anything emanate from them and the place is as dry as a bone. At most there will be a sprinkle, not enough even to clean your bicycle. Yellowknife is the only place I know where rain makes things dirtier: it wets them only enough to allow more dust to stick to them. So accustomed are we to the gun talk that on the day of the storm, children continued to play happily in the park as the skies blackened with a terrifying menace. I suspect they went home only because they could no longer see each other, or the ball. One boy returned after the storm, but nobody joined him, so eventually he took himself home. Meanwhile, life goes on. 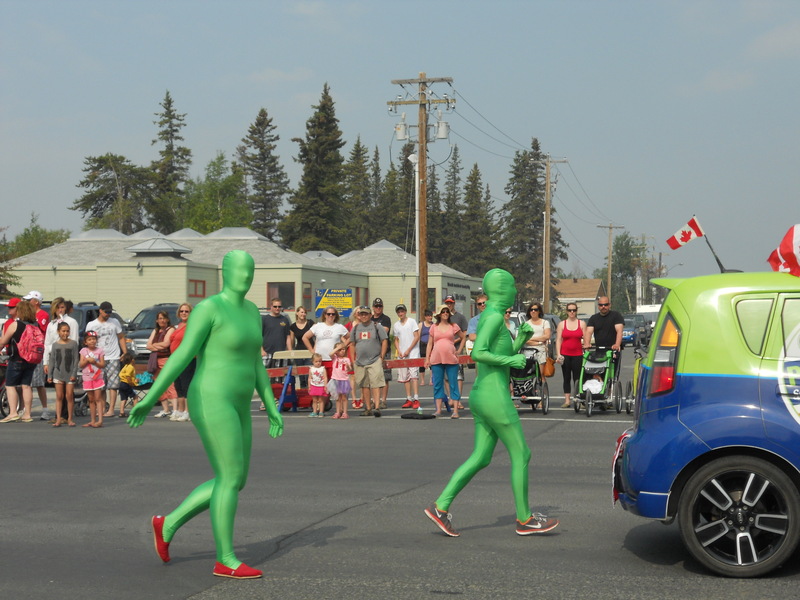 This year the Canada Day parade took place under a slight haze. I managed to attend for the first time, joining the throngs in the sea of red and white along Franklin Avenue, the main drag. Among them were lots of kids, ranging from the irritated and tired of waiting, to the bouncing around with excited anticipation, and parents trying to keep them out of the roadway. Any group that wants to participate in the parade simply has to pay a fee at City Hall, so there was a wide variety of floats and paraders on foot. 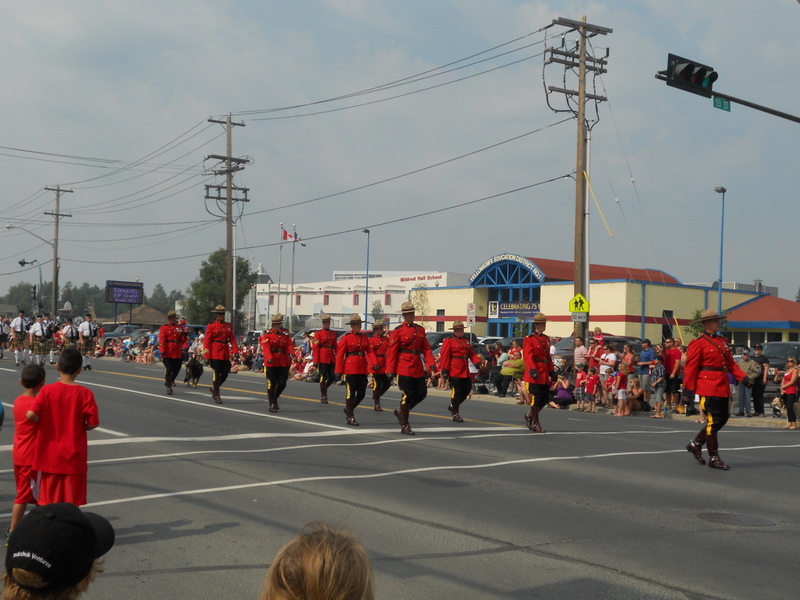 The RCMP started things off, in their distinctive red dress uniforms. Perhaps I should call them the RCP, because none of them was mounted. 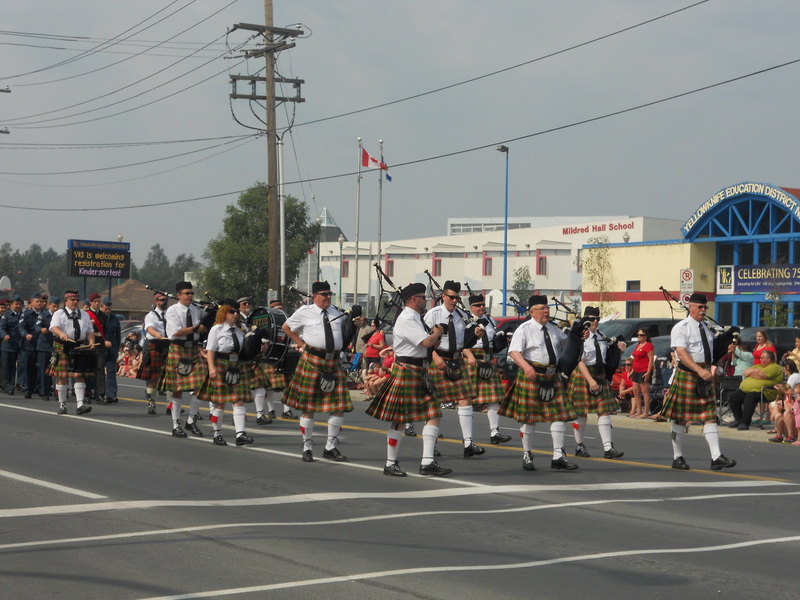 Next, along came the Northwest Territories Pipe Band. 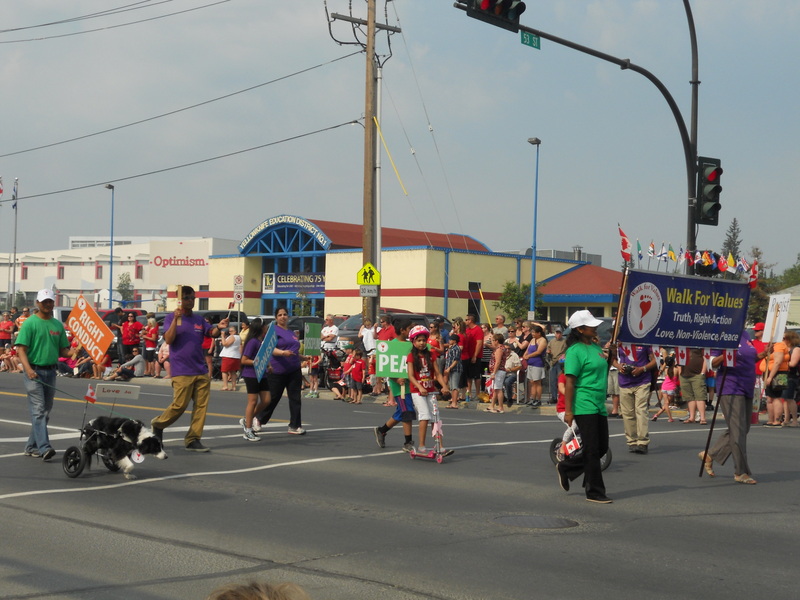 Following them, a group of cadets and the Yellowknife Company of the Loyal Edmonton Regiment. 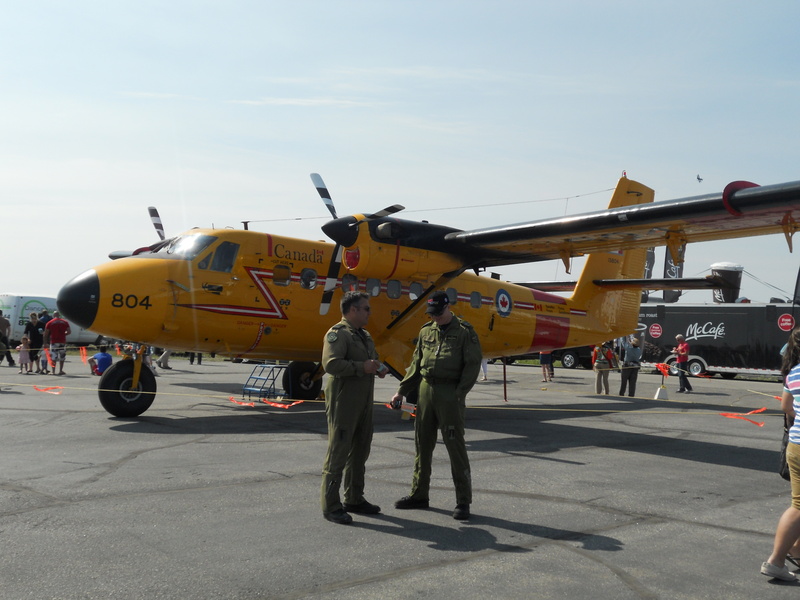 Yellowknife is a military town, home of the Canadian Armed Forces’ Joint Task Force North, which is charged with Canadian sovereignty and defence operations in the North. Living in a small town means that news travels fast, but by the time it’s made a few hops, it may not necessarily be accurate. 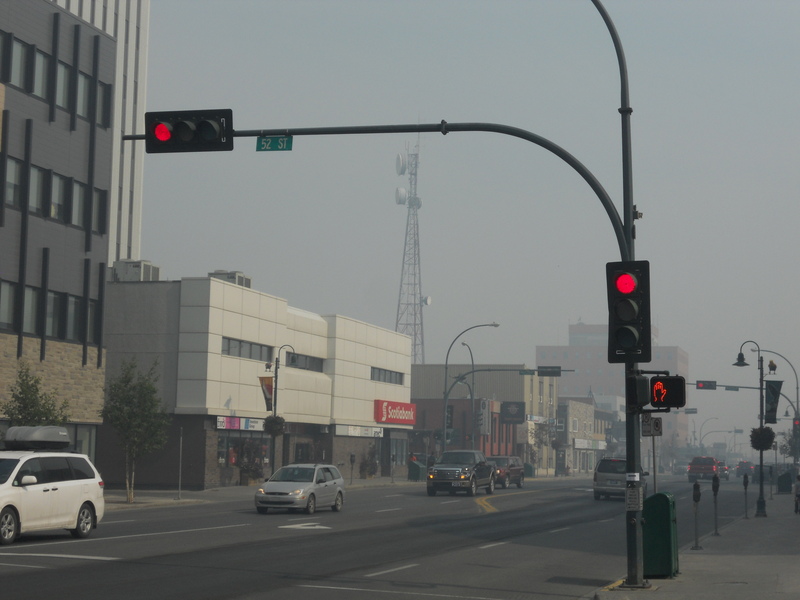 I heard on the news that if the forest fires were to get close enough to threaten Yellowknife, the city’s plan was to gather everyone into a central location and wait for help. Needless to say, such a plan didn’t get my vote of confidence. Instead, I made a mental note of the people I know who own a boat, the faster the better. However, the alleged plan appears to be a case of somebody saying something that somehow morphed into “the official plan” and ended up being reported, to all of Canada, on no less authoritative a source than the CBC national news. I’m still not sure what is the emergency fire plan. In the event of an attack, with all of the military and RCMP personnel in this town, I’m satisfied that we’ll be well defended and safe…unless it’s an attack by fire. 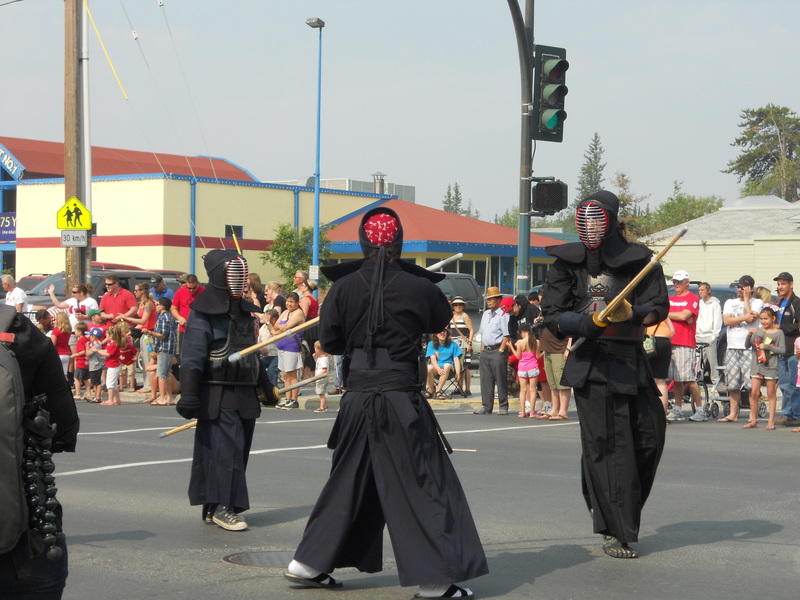 The neat files of the forces of combat and law and order quickly gave way to parade participants in more casual formation. 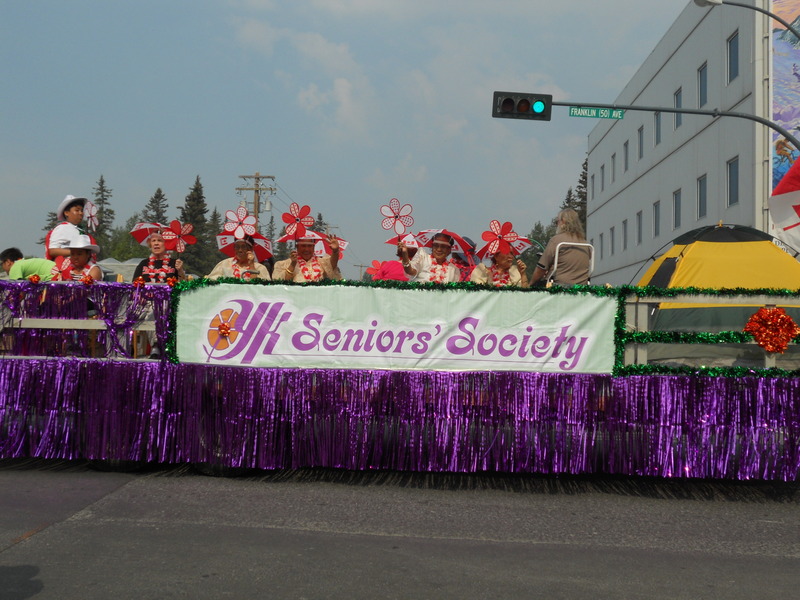 The Yellowknife Seniors’ Society’s float was as gaily decked out as its members, all of whom seemed to be thoroughly enjoying themselves. and some who defied description, but who appeared to have fun regardless. The parade was quite short, so if you arrived late, you could have missed the entire thing. 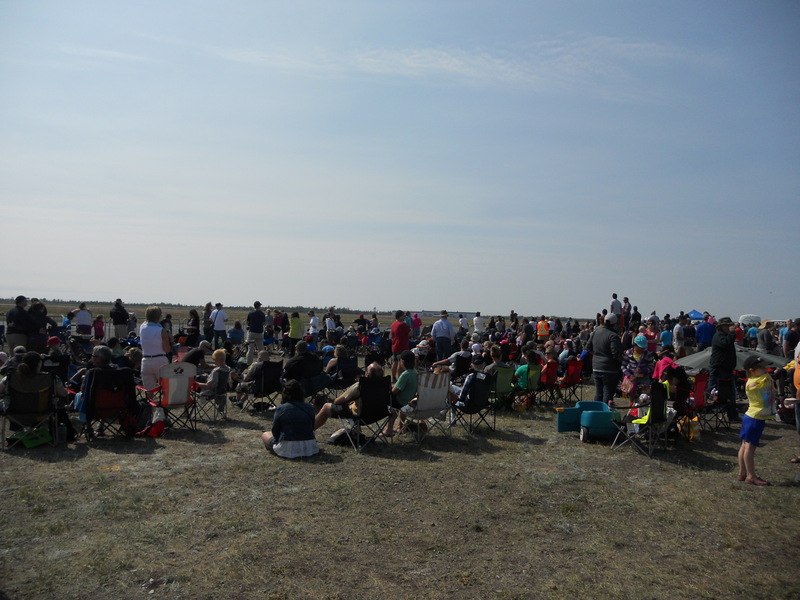 Another popular July event is the Airshow. It takes place every 2 years and is a show of both human and airplane acrobatics. Some of the regulars are the Skyhawks (the parachute team from the Armed Forces), stunt pilot Super Dave, a.k.a. Dave Mathieson and the Snowbirds, the iconic flying squadron of the Royal Canadian Air Force, whose precision formations, multi-coloured jetstreams and habit of appearing from nowhere make them a crowd favourite wherever they go. On the ground, attendees could gawk at or tour the inside of various types of aircraft. 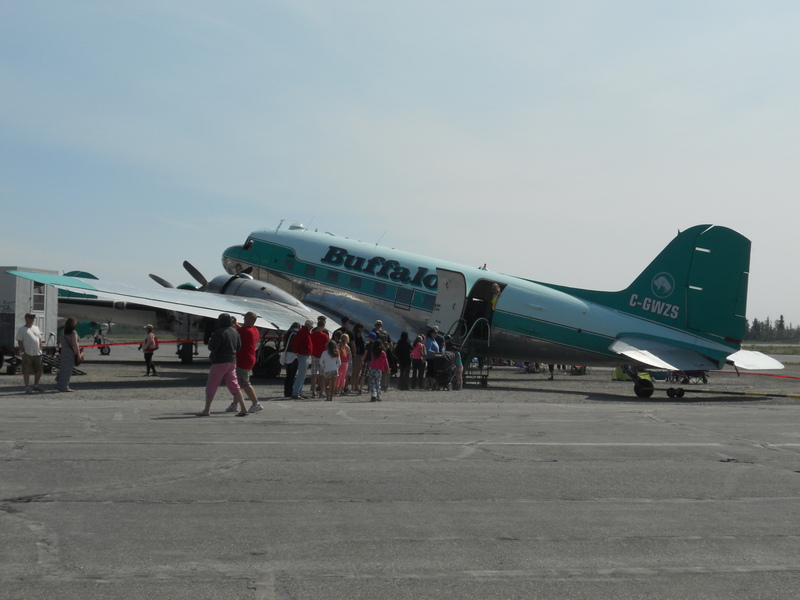 They could get inside the old-fashioned plane of Yellowknife’s own Buffalo Airways. Or they could be dazzled by a very bright yellow plane, which was roped off from spectators. 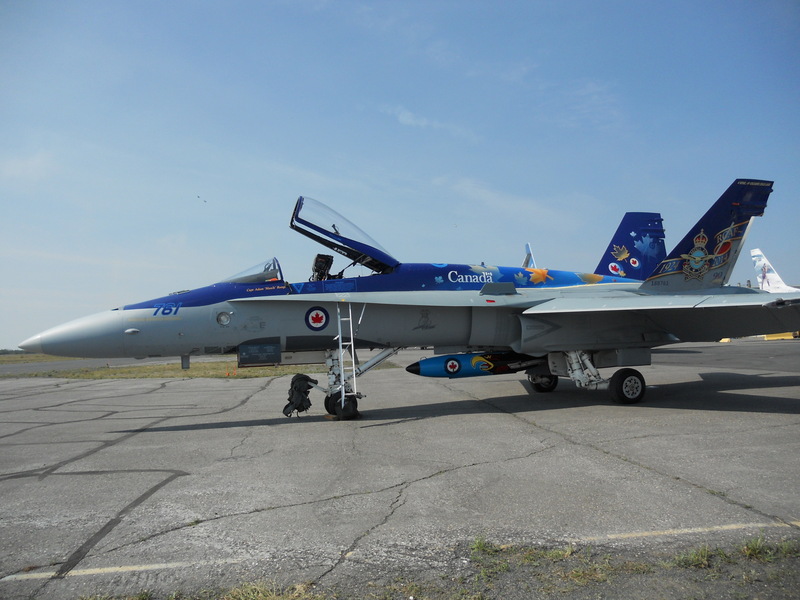 Fighter jets are always a hit, and the super-sonic CF-18 was available only for gawking from a distance. No doubt it’s way too expensive for curious fighter-jet fans to be allowed to sit in the cockpit, and risk having them ruin its costly buttons and levers, or hit the worng one. At the 2012 Airshow, I was practically barbecued. The sun was relentless, its heat radiated off the tarmac, and there are no trees at that location, so people took refuge in the shade under the wings of the planes. There was not an inch of shadow that wasn’t occupied. This time the weather was cooler, which was fortunate, because the number of aircraft was definitely less than at the last show. Perhaps the Air Force is busy patrolling the Arctic this year, if reports of sightings of Russian fighter jets in Canadian airspace are to be believed. Nevertheless, there was a good crowd and as usual, people showed their appreciation for the stunts in the sky. At the next Airshow, let’s hope that the summer will be smoke-free. Copyright © Kathryn Birchwood and FrozenTrini 2014. The use and/or duplication of this material without the express and written permission of this blog’s author and/or owner are unauthorised and strictly prohibited. Excerpts and links may be used, provided that full and clear credit is given to Kathryn Birchwood and FrozenTrini, with appropriate and specific direction to the original content. Enter your email address and click on the 'follow' button to receive new posts by email. Yes, Yellowknife. This is why. Copyright © Kathryn Birchwood and FrozenTrini 2012-2016. The use and/or duplication of this material without the express and written permission from this blog’s author and/or owner are unauthorised and strictly prohibited. Excerpts and links may be used, provided that full and clear credit is given to Kathryn Birchwood and FrozenTrini, with appropriate and specific direction to the original content.